SalonTarget was designed by salon professionals who understand the day-to-day challenges that come with running a salon. SalonTarget was designed by salon professionals who understand the day-to-day challenges that come with running a salon. The software system allows users to manage appointment bookings and client communications, while tracking employee time sheets, service and retail sales, and other business data like client retention. Use the Command Center scheduling feature to view a master salon calendar. View the day’s bookings and identify open slots for walk-ins, upsells, or social media pushes. 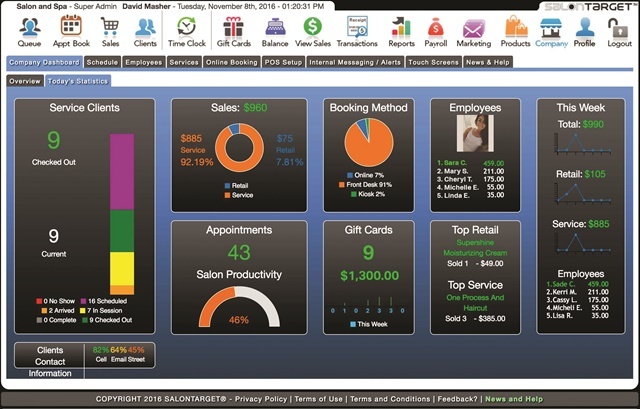 The EZ Fix Transaction Tracker automatically stores all sales information for salon services, retail products, and gift cards. If needed, you can search through past transactions using the client name, service requested, date, time, price, or payment method. Use the customizable and confidential payroll function to create unique pay levels for each employee, adjust pay rates, and manage logged hours and overtime. View sales reports based on client, date, service summary, or transaction. When given their own access code, stylists can also pull up their sales reports for the day and monitor growth over time. The multi-cash drawer balancer automatically records every transaction to create an error-free balance report at the end of the day. For more information, go to www.salontargetcloud.com.